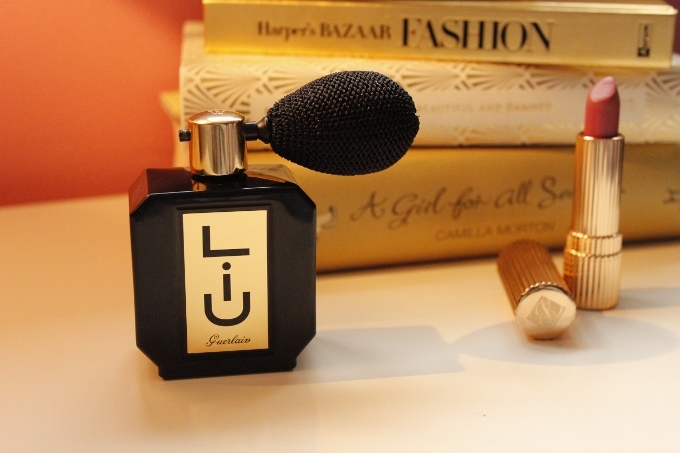 Guerlain Liu Perfumed Shimmer Powder - RRP £50.50, now £25.25 in Harrods Sale. I hate to say it, but sometimes I become really bored of beauty products. Although blogging can get me really excited for products it means make up sometimes becomes something I buy because of the ingredients list, because someone recommended it or just simply because everyone else bloomin' well has it. Sometimes the genuine joy of make up disappears. But this product has brought it back, with a bang. Make up for me was something I spent a long time longing to wear as a child. I wanted to use make up to paint my face to look like Scarlett O'Hara, Elizabeth Taylor, Maureen O'Hara, Eva Gabor, Marilyn Monroe... I remember announcing that when I was grown up I was going to dress up as Baroness Schraeder from The Sound of Music for Halloween every year and have the perfect hair, the long gold dress and the beautiful, beautiful face. That was probably where my launching interest in fashion and beauty came form - too much time spent watching old movies as a child and being fixated on the glamour of the women. Hence probably why red lipstick is probably still my favourite make up item to wear and buy - it epitomises that old Hollywood glamour for me that I wished (and still do wish) so much to achieve. It probably is also from these films that my life long desire for an old fashioned dressing table adorned with beautiful bottles and my grandmother's dressing table set can be traced to. 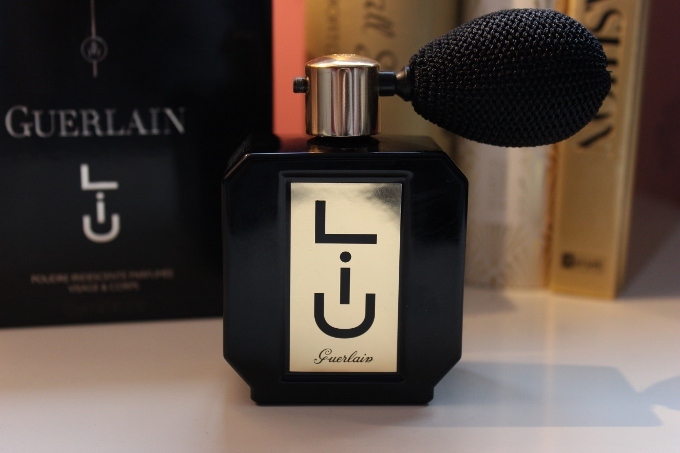 And when I do manage to get that dressing table, don't you just think this Liu Shimmer Powder by Guerlain will make for one of the most beautiful items on it? I don't usually get too concerned with packaging, but can we all just take a moment to look at it. 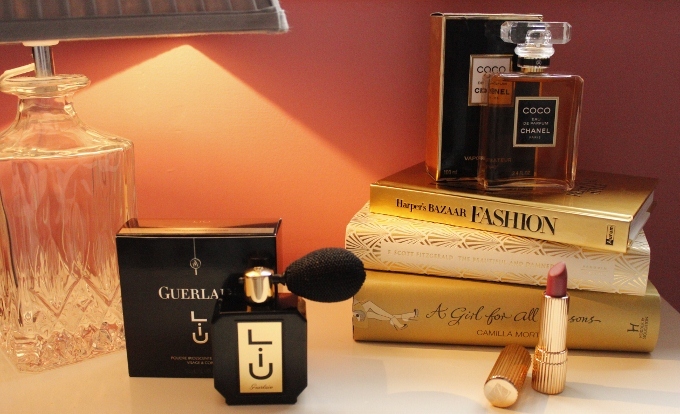 Part Gatsby, part Elizabeth Taylor, elegant, stunning and just 100% pure old fashioned glamour - it really is something. This is the sort of product that gets me excited. 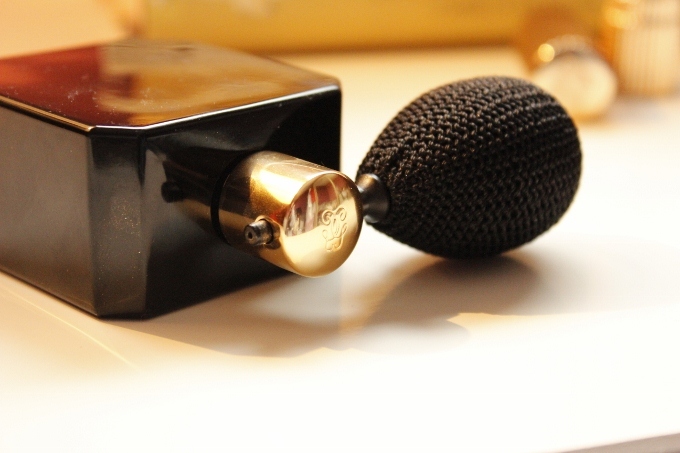 When getting dressed and then lifting this and using the bulb to expel a dusting of shimmer over my decolletage before gliding out the door, I feel like one of the women I always wanted to be 'when I grew up'. In fact, when using products like this, it's probably the closest I ever feel to actually being grown up. So, appearances aside - what's the actual product like? Quite simply - it's beautiful. The scent of this is just beyond any kind of words I could muster, it's clean and not too strong but it's sophisticated and womanly. As awful a description as this is - it smells like very sophisticated baby powder. 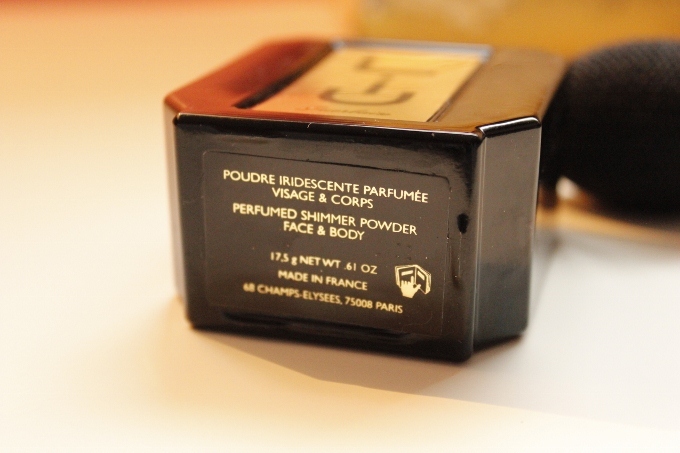 Having said that, although the shimmer will last till your next shower and properly wash it off, the scent is very light and will disappear fairly quickly, so you can easily wear a perfume rather than letting this scent dominate. And as for the shimmer? It's again, incredibly beautiful. 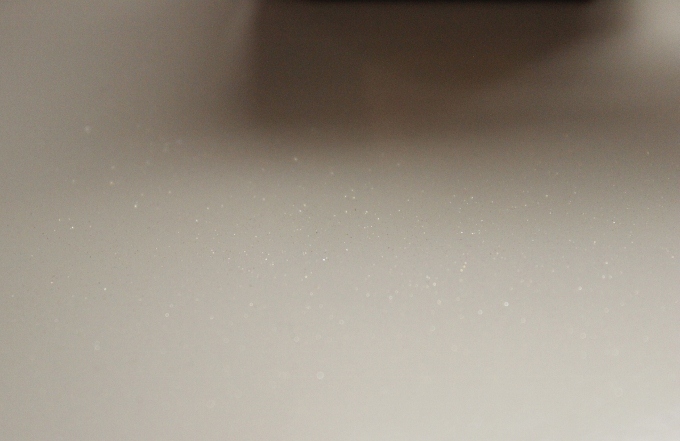 It catches the light and dances and twinkles, but in a way that I couldn't even begin to photograph it on skin - the last picture is it sprayed onto the surface of my bedside table. It's very fine, but not so fine it won't be noticed. Consider yourself warned - don't wear this unless you are going out, it's not an every day product designed to give you a glow, it is a proper shimmer. However, it's not glitter and it's not garish. The only product I own that is similar to this is a Clarins body shimmer powder, from their Christmas collection in 2010, and whilst that is a beautiful product it's much more glittery and it's applied with a powder puff, so you can definitely end up a bit less sparkle in the candle light and more throwing more reflections round the dance floor than a mirrored disco ball if you're not careful, and the bulb and spray application method on this Guerlain product means you're in much less danger of it all ending up that way. Overall? This is probably the most excited I've been about a product that's not a red lipstick for... at least a few months. Possibly in a few years, actually. This really, truly is a love affair that's been started here, and I 110% recommend this product. Apart from anything else it's currently half of - making it £25.25 - and it's worth that, and more.